When sending an email (a new message, reply or forward) in Outlook, the program has a nasty habit of changing the font face, size, paragraph spacing, etc. to the one used in the previous message or imposed by the default style. This problem specifically refers to the general paragraph rules. In MS Word and also other text editors, it is common practice to treat the Enter key as a new paragraph and the Shift + Enter keys combination as a new line of text. In Outlook, however, there is no difference between these actions. No matter if the Enter key or Shift+Enter keys are used, always only a new line of text is created. If a user wants to make a new paragraph, he or she needs to double-hit the key. This leads to discrepancies in how the text is presented in mail clients other than Outlook, not to mention the additional work for the writer. A solution other than using the double Enter key, is to modify the default, Normal style in Outlook. The drawback is that the modified Normal style is applied only to the new message, and not to the reply or forward. Another approach is to create a custom style from scratch that will work better than Normal and be applied to both – new emails and replies/forwards. Unfortunately, this is not a full solution either as the custom style is not active by default when opening the message editor, and you need to switch to it manually every single time. A complete solution is to have a custom style, which is automatically enabled by an Outlook macro when composing new emails, replies or forwards. Below you will find step-by-step instructions on how to achieve this. Step 1. Create your custom style. To do it, start off by creating a new email in Outlook and typing a bunch of words. Then highlight these words, which will bring up the hovering menu with the Styles button. Hit the Styles button and then the Create a style button. click Format button at the bottom and open the Paragraph window. In the Spacing section set the After value to 12 pt, the Line spacing to At least and the At: value to 14 pt. Step 3. Save your settings by clicking the OK buttons all the way out to the new email you created, then send it as a test message to yourself or different email account. Step 4. Reply to the test message from Outlook, but don’t send it yet. Instead, type any words in the reply, highlight them to bring up the hovering menu with the Styles button. Press the Styles button, find the new style you created in Step 1, right-click it and choose Modify… . Step 5. 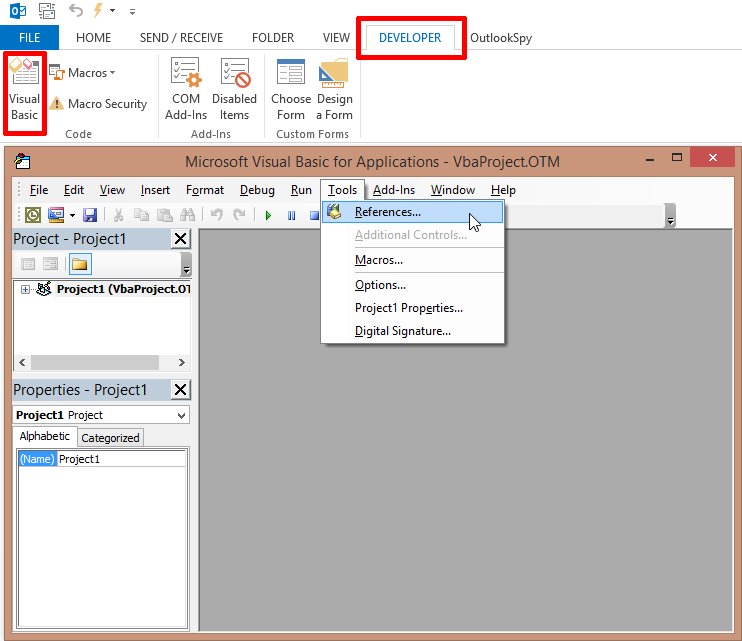 In the Modify Style window replicate the settings you introduced a moment ago in Step 2. 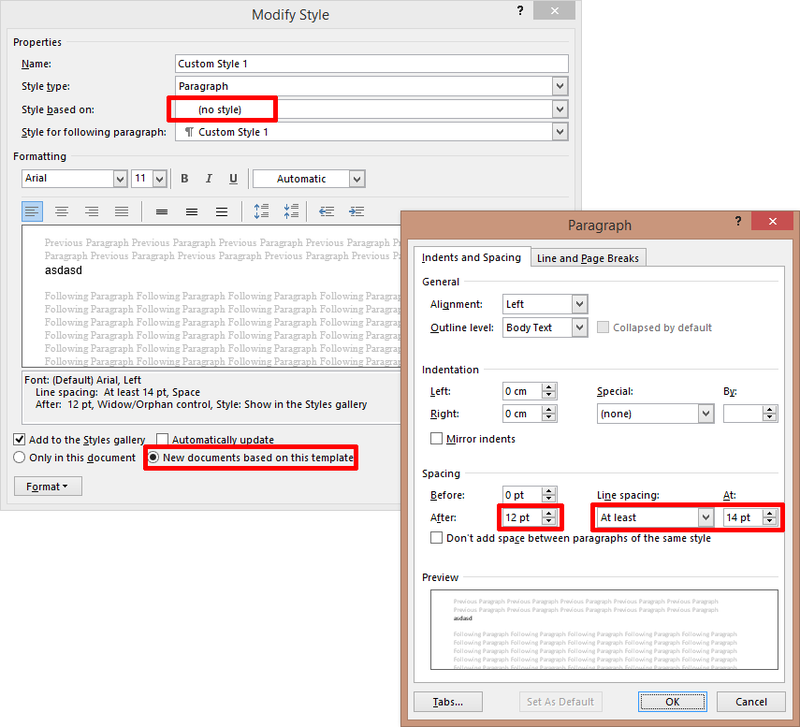 Don’t forget about checking New documents based on this template and setting the Style based on option to (no style). Step 6. After making sure that all settings have been replicated correctly, OK your way out of the Modify Style window and send the reply. Step 7. Repeat Steps 4 and 5, but this time forward the test message from Outlook. Step 8. Test the new style with different messages, preferably received from other users. 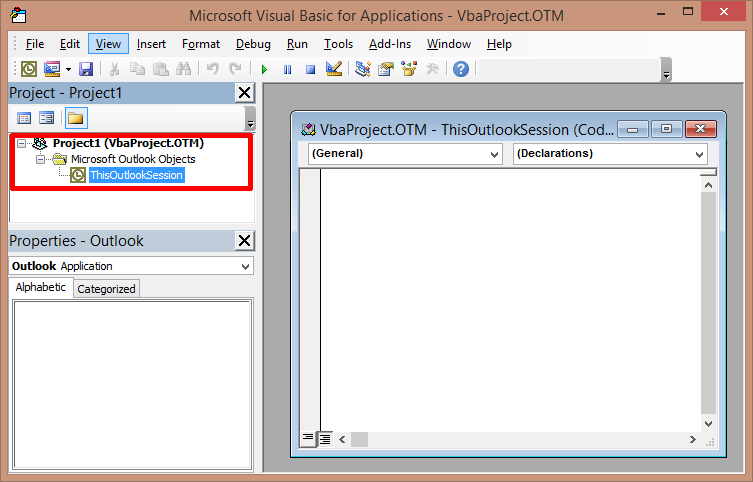 Show the Developer Tab on the Ribbon in Outlook. In the Developer Tab click Macro Security and change it to Enable all macros. Click the Visual Basic button. In the next window click the Tools menu on top and select References. NOTE: Some of these libraries show a version that depends on what MS Office suite you have. In MS Office 2013 the version is 15.0, in Office 2010 it’s 14.0, and in Office 2007 it’s 12.0. The Microsoft DAO Object Library is the same across all these suits of Office. Once you have the above references set click the OK button. objStyleName = "Custom Style 1"
Make sure to change the style name to your own, as described in the macro’s comments. In this case it should be Custom Style 1. Save the project by clicking the blue disk icon visible on the top, or by using the Ctrl+s keyboard shortcut. 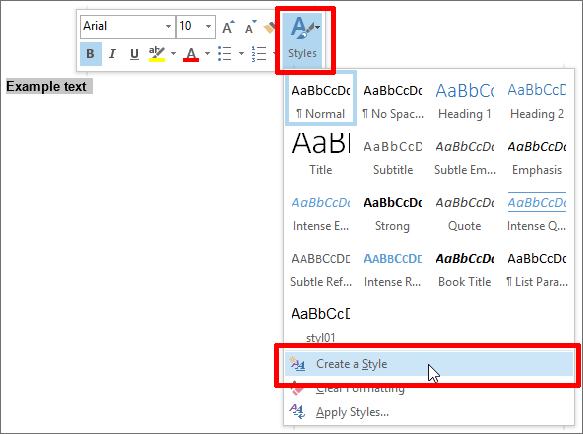 That’s it – from now on your custom style is the default one when writing a message in Outlook, even if a different formatting was used in the email you are responding to. This way you can make sure that the correspondence look is unified and not altered by other users. Q: does this also solve the double line spacing taking place when exchanging mails between Gmail and Outlook? Yes, as long as nobody uses double enters in the conversation, the double line spacing problem should be solved across different email clients. This code works great but I cant figure out how to use an existing signature with links and images with your code. Any ideas that would help is much appreciated. I am not sure what issue you are experiencing. Does the macro change anything in the existing signature? An email signature set up in Outlook’s signature editor should not be affected when you follow the steps from this article. The message’s style and the email signature’s style are two separate things. It is a very great code! I tried on my Outlook 2016 and it is works on new message. But when I reply or forward, the fonts size was changed to 10. The new style was 11 when I create it, but don’t know why it become 10 after. Even I tried to modify it, it will back to 10 after restart Outlook. Problems with replies and forwards usually happen when step 4 (or 7) of the tutorial is omitted. I’d try following the guide from the very beginning and see if it helps. In the worst case scenario, you can switch to the configured style manually. I want to change the font of the emails that come TO me (rather than my own). Is that possible? You could change the font of the incoming emails, but only if you converted all incoming emails to plain-text format using Outlook Trust Center > Email Security and then set the font to your liking in Outlook Options > Mail > Stationery and Fonts. Mind that this solution has some major flaws, e.g. hyperlinks will not work and no images will be visible in emails. The fix for new emails works great, but I can’t get the macro to work for replies & forwards. I don’t get an error, it just reverts to Times New Roman and none of my paragraph settings are there. I’ve made sure that I put the name in the code. I so want this to work! Actually, it’s working for Reply but not Forward. I can live with that since I hardly ever forward, but I’d love for it to work. Please double check you completed step 7 of the guide and inserted the name of your style in both places of the macro (The places are marked by comments: ‘Change the name of the style to your own). Hi Adam – yes, it’s changed in both places. Since you have updated the script correctly and have ensured that step 7 was completed beforehand, I do not know what might be causing this different behavior in case of forwards. Since you said you do not forward much, I would just switch to your custom style manually on those rare occasions. Great job. It work beautifully. Thanks! Can we configure this to change the font of received (incoming)HTML emails? I’m afraid that it won’t work with incoming messages. I followed the steps as described but whenever I create a new email, reply or forward, it defaults to Normal style. I even put a break point on VBA (first line of code: If ActiveExplorer.ActiveInlineResponse.BodyFormat = 1 Then Exit Sub) to see if it was going through it but nothing happened. So I checked again, and found that there are two places where I need to change the style name to the one I chose. Once I did that, it works beautifully! Thanks for this thorough and easy to follow tutorial. It’s great for old folks/tech-idiots like me who think an “object” is something you hold in your hand, “OLE” is slang for “OLD” and have no clue what “macro” means! This is the code I have, but it gives me the Run-time error. Please help! Hi Barbara, Can you provide the exact error code you are getting? Thanks for this post. It addressed an issue that I’ve been struggling with since installing Office 2016. Unfortunately, when I tried it, there was a compiling error on start up… I suspect a small change in Outlook in the new version, with which this was not compatible. (?) If there is a required update to the code, I’d like to know, because this macro would be really useful to me. Thanks! Can you provide the error code? How do I take an advertising letter, or document with graphics etc. and make it the email itself. Or, how do I make the document the first thing the person sees? I cannot send attachments. I have tried the cut/paste, and plain format, but I lose the artwork and the unique text design. Great tutorial artical :) Thanks! Jerry, that code works when you open or response email. If you want to change all emails for good, you should make a loop For each elements in folder and save it. But that ‘ll change the objects date. You can also use rules with code, to change only new one. thanks for this code, it’s almost exactly what I was looking for! One addition I would like to ask for if possible, is to automatically convert the body format to HTML aswell. If that is doable I’d really appreciate a hint on how to do it. Hello, Adam! I recently changed to outlook.com email and I am trying to follow your instructions as given above but I do not get the windows that you are showing in the examples. My window .. or menu or whatever it’s called … for changing styles doesn’t look anything like that. It’s just a pop up with a list … no icons… nada! Frustrating! I’ve spent a couple of hours looking for the solution to my problem and your instructions are the first ones that have given me “hope”… which turned out not to work either. Keep in mind that, to apply my solution, you have to use Outlook. This article explains how to configure an outlook.com account in Outlook: http://www.slipstick.com/outlook/config/configuring-outlook-com-in-outlook/. Excellent tutorial and great use-case! Thank you.